Travis Bruce Black submission to Manitou. C, thank you for your time and consideration of my works. I have a massive series of birds called the “chirp” series. Over the last ten years I’ve created 377 chirps of varying size from 8 feet to 8 inches. The idea of the series is to create exuberant life with mystery, optimism and joy. I also work with other subjects like deer, foxes, coyotes and wolves. While I aim to metabolize the lessons of each piece, they each have their own character and direction while holding together as a coherent series. I’m humbled by the reception and mass appeal they have earned and I hope you will consider them for representation. chirp375 PzzaBnz + 32x96” + Acrylic on panel + 12000.
chirp374 Brightwave 65x21” + Acrylic on panel + 5500.
chirp376 Nuzzle + 8x8” + varnished watercolor on paper mounted to wood + 600. I have an ongoing collaboration with India’s couture fashion company Gauri and Nainika. They have licensed some of my existing works and commissioned paintings for many wedding and evening gowns. I’m proud of the collaboration, the project has energized my collectors and my own expression. 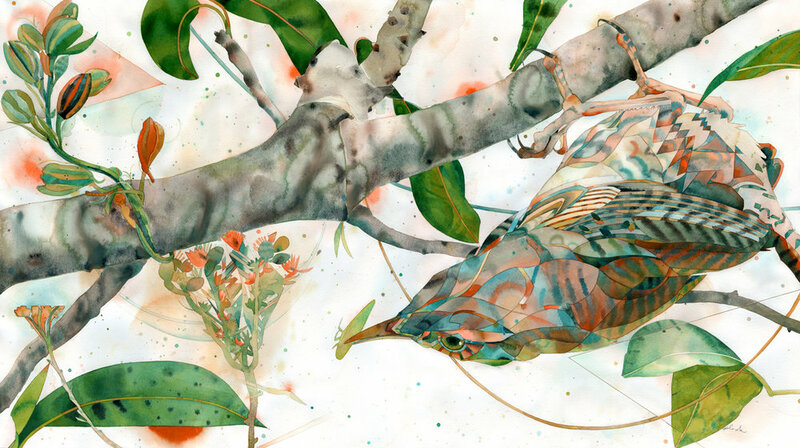 chirp372 TendR + 24x43” + varnished watercolor on paper mounted to panel + 3800. From this point on in the presentation are works I’ve included that represent my current values in creating paintings, but are no longer available. I’m shooting for a realism that works both photographically and emotionally. My current focus is large scale acrylic chirps, a grid-series of 7x7” watercolor chirp portraits and medium to medium-large watercolor chirps. Thank you for spending time with my work, feel free to contact me (phone# included in email). I have a studio in downtown Albuquerque if you would like to visit or I’d be happy to come your way with works. I’m looking for the next partner in getting this beauty out there and you were my first choice. I feel my work would fit in Manitou, considering quality, color, scale and subject and think it also offers something new for your already solid roster. I’m excited to see if you agree. My previous gallery in Santa Fe did very well with my work and the director Hether Bearinger would be happy to discuss details of our former business relationship. Thank you again for checking me out and for the work you guys do there: supporting artists and literally co-creating beauty in the world.